Dessert Darling Kathy Casey’s Dish D’Lish Fruit Cake with Maker’s Mark | Dessert Darling made with Maker’s Mark. 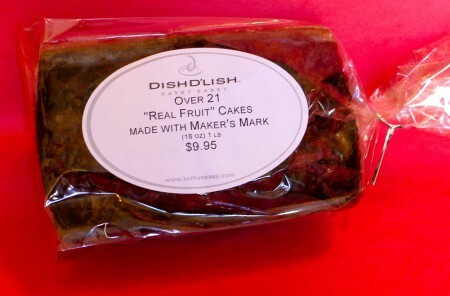 This sounded intriguing so I ordered the Dish D’Lish Fruitcake online. It just arrived today and I have to say… it’s still fruitcake. While the cake is clearly made with fine butter and hints of that lovely Maker’s Mark, its totally invaded by mountains of nuts and gelatinous, zingy fruit blobs. Like no ice cream can really be bad ice cream, no fruit cake can really be good fruit cake. I am a purist who rarely likes fruit near my desserts as it is. Perhaps I wouldn’t begrudge the treat so much if it were labled “Holiday Trailnut Bread,” but calling it cake?! That’s just an assault on the English language. 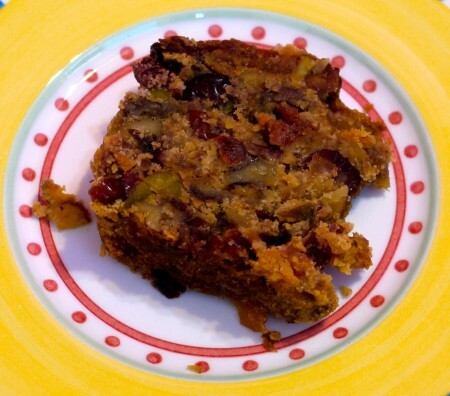 For mor information on Dish D’Lish’s fruitcake by Kathy Casey, click here. I’ve never really been a fan of fruit cake or panettone, but you should try the loaf of Panettone bread at Trader Joe’s! This is the first time they’ve offered the bread in the loaf section…it’s not as dense and mealy as the normal boxed panettone. Plus, it’s to die for once it’s been toasted and lightly buttered. who doesnt love to munch fruit cakes, they are really great..